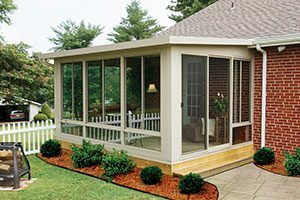 When searching for the most stylish, durable patio enclosures in the Cherry Hill, New Jersey, area, homeowners should look no further than SRA Home Products. We have been expertly installing a wide range of outdoor living products since 1988, and our factory-trained and -certified technicians remain dedicated to providing an exemplary installation experience to this very day. This commitment is evidenced in our A+ rating with the Better Business Bureau, which also stands as a testament to the industry-leading products we have provided since our very beginning. As if all this weren’t enough, TEMO backs every one of its patio enclosures with a lifetime transferrable warranty, so you can trust that your beautiful new outdoor living product will be protected for years to come. Learn more about the patio enclosures we install by contacting SRA Home Products today. We will be glad to schedule a free consultation at your Cherry Hill, NJ, home.